Brazil, Serro Frio gold ingot #114, Dom Pedro II, 1832, with original guia, plated in Prober, in the Treasure and World Coin Auction #10 (auction.sedwickcoins.com) held October 25-26, 2011. The pseudo-monetary gold ingots of Brazil, made from 1778 to 1833, are among the rarest items of South American numismatics. They are comparable to the U.S. pioneer gold issues of the California Gold Rush of 1848–1855, as they were made from natural gold that merchants and prospectors brought in to official foundries for testing, smelting, marking and taxation. Typically the ingots were subsequently sent to Europe and melted down, making them quite rare as a group today. Rarer still is each ingot’s original guia ("guide"), the official one-page document produced at the foundry legalizing the ingot as currency and bearing the ingot’s number, owner, purity, weight and date, plus the foundry name and signatures of its officials at the bottom to show that the tax was paid. 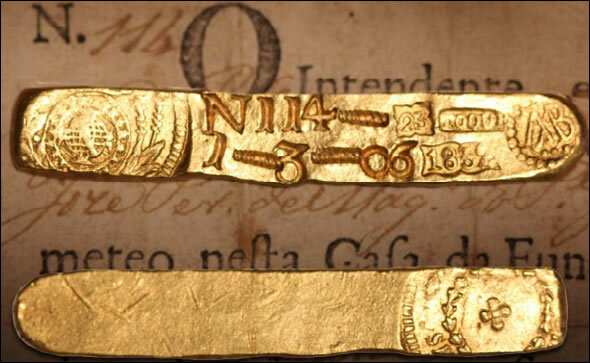 Essentially a "birth certificate" for each ingot, the guia was a fragile and somewhat unassuming piece of paper that was almost always lost or inadvertently destroyed down the line, but it bore the utmost importance in establishing legitimacy and value. Probably fewer than 10 surviving ingots still have their guias. A bit over half of these are in private hands; more than one third of the known pieces are permanently housed in big museums like the Museu Historico Nacional (Rio de Janeiro), the Banco Central do Brasil (Brasilia), the Museu de Arte Sacra (São Paolo), the Museu Numismático do Banco do Espírito Santo (Lisbon) and even the American Numismatic Society and Smithsonian Institution in the United States. 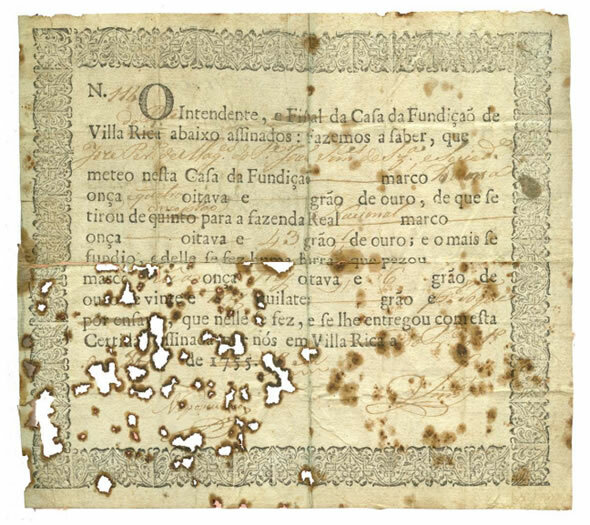 Significantly, only two of the 36 specimens from the Carlos Marques da Costa collection recently acquired by the Museu Numismático do Banco do Espírito Santo have original guias. (Featured in the Sotheby’s auction of May 30, 1997, these 36 ingots were purchased privately and the auction was cancelled.) Many important numismatic museums and collections around the world have no Brazilian ingots at all. It is also important to note that our specimen, as one of the last ones made, is one of only about a half-dozen surviving specimens issued under Dom Pedro II (1831-1889) "the Magnanimous," last ruler of the Empire of Brazil, an entirely different government from the Portuguese monarchy under which the earlier pieces were made. Curiously, the accompanying guia was pre-printed in 1755 but completed and modified by hand in 1832 to reflect the new regime and rates. It is hard to imagine a numismatic item with more patent history! In fact, this 1832 Serro Frio ingot is the only Dom Pedro II specimen of this foundry ever offered at auction in the United States with its original guia. For comparison, the much-heralded Eliasberg collection, sold in 2005, which contained 4 ingots, had no Serro Frio, no Pedro II, and no guias. A relatively common Sabará ingot in Eliasberg sold for $77,625. While the two specimens in the Norweb collection (1997) included a Serro Frio, both ingots were of João VI, and neither had a guia. In addition to collector interest, these rare ingots have drawn the attention, admiration and study of a number of famous numismatic firms and researchers over the past century and a half. The most ardent student of these bars was the numismatic scholar and author Kurt Prober, who in fact once owned this very specimen in the late 1940s (more about that later). Even in their own time these ingots were considered special. The idea behind these ingots was simply to monetize new gold into circulating currency and to make sure taxes were paid in the process. In fact, they were subject to confiscation without notarized guias; their prescribed monetary value in réis was written on the accompanying guias and not stamped on the ingots themselves. The ingot itself is basically a flat, irregular, extended rectangle, approx. 69 x 11 x 3mm, with most of its stamped markings on one side, including (from left to right): circular seal bearing the arms of the Empire of Brazil; serial number N 114 above the numbers 1 — 3 — 06 for 1 onça 3 oitavas 6 grão (1 ounce 3 eighths 6 grains); fineness as "23" and "TOQUE" (meaning struck in 23 karat) above the date 1832 in incuse boxes; and an intertwined monogram AAB (for assayer Antonio Avila Bittencourt) within an incuse circle with beaded border. Three ribbed lines in the fields between the stamps are security cancelations to prevent further stamping. The reverse shows the round seal for the Serro Frio foundry, showing the first two letters SE(RRO) at the bottom. While the seals are typically weaker, the middle punches are very sharply struck and even lustrous inside (virtually as made). 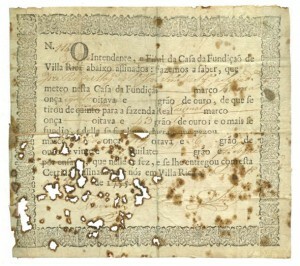 The guia is fundamentally intact, once folded and now riddled with small holes in one quadrant, but with all important details still readable, including the ingot number N 114, date, fineness, weight and foundry. Like the other known guias, this one shows the quantity of gold brought to the smelting house ("1 Onca e 4 Oitavas" = 1 ounce and 4 eighths) and the percentage taken by the government, known as the vintena (5%) in the amount of 43-1/5 grão (grains). The owner is listed as "Joze Per(a) de Mag (es.) do P(e) Joao Sim (oes) de Sz(a). e Socied(e)." Interestingly, the "Rica" of the printed foundry name Villa Rica (in two places) was crossed out and overwritten with "do Ppe" for Villa do Principe, which was later re-named Serro Frio. The official signatures at the bottom are "Esq. Nepomuceno" and "Dr. Simões." As previously mentioned, the guia was pre-printed in 1755, but the date on the document was hand-corrected to 1832. One other interesting modification is the change from the printed word "Real" (royal) to "Nacional" (national), reflecting the change to a parliamentary monarchy in 1831. Handwritten on the back, in the upper-right corner, is the circulating value of the ingot as "17$380," meaning 17,380 réis, a sizable sum in its time. The first appearance of this ingot on the numismatic market was as #3709 in the 1906 catalog of the Estate of Joaquim Gomes de Souza Braga. The next appearance, in 1936, was in a sales price list from Santos Leitão e Cia of Rio Janeiro (item #79). In 1941 the bar was catalogued by Kurt Prober in his monograph Ouro em Pó e em Barras Meio Circulante no Brasil 1754-1833 (listed with its guia and plated as #423 in the 1990 edition), and in fact Prober himself acquired the ingot from Jael de Oliveira Lima in 1947 — but without its guia. Oliveira found the guia in 1948 and sold it separately to Prober, who had already sold the ingot without its guia to a Dr. C.H Townsend. Kurt Prober then bought the bar back from Townsend and offered the newly reunited ingot and guia for sale in the price list of coin dealer Hermann Porcher in 1948, which was the last time it was publicly offered. American Numismatic Rarities (New York). The Louis E. Eliasberg, Sr. Collection of World Coins & Medals, auction of April 18-19, 2005. Costilhes, Alain. "Revising Brazilian Gold Bars," in Actas — Proceedings — Actes of the XIII Congreso Internacional de Numismática in Madrid in 2003 (coord. by Carmen Alfaro, Carmen Marcos y Paloma Otero), Madrid, 2005. Marques da Costa, Carlos. "As Barras de Ouro do Brasil – Sua Ordenação em Catálogo," in Atas do Primeiro Congresso luso-brasileiro de Numismática, São Paulo, 2000. Prober, Kurt. Ouro em Pó e em Barras Meio Circulante no Brasil 1754-1833, 2 vols, Rio de Janeiro, 1990. Sotheby’s (London). Brazilian Gold Currency Bars, auction of May 30, 1997. Spink & Sons. "An Unpublished Specimen of Brazilian Gold Bar Currency, Issued by the Gold Refinery of Villa Rica, 1814," in Numismatic Circular, vol. XI, number 124, London, March 1903. SpinkAmerica (New York). The Norweb Collection of Brazilian, Bolivian, Colombian and Chilean Coins, auction of March 4, 1997.